My hope to one day assist someone doing research on appliances and things with an actual review and photos. Basically, this is what I was looking for when shopping. Last year at some point as we were trying to buy an apartment I came across a lovely secretary desk at a swell Scandinavian furniture shop. It was beautiful and perfect and was selling for a fair price. I didn't buy it because we didn't have the apartment yet and wasn't really clear if I needed a desk and/or if one would fit in the apartment to begin with. I was wrong. I should have purchased that desk somehow. Since then I've spent the past 10 months or so searching high and low for a decent looking secretary desk. Ideally something that I could keep my laptop in and close up when I was done as the desk would probably be out in the open somewhere in our apartment. So much research. I feel like the "secretary desk" tag in Evernote is about to take over the entire account. There are lots of nice secretary desks out there. Most have issues. The little Ikea one kept popping up. I had seen it in the store before and it's small - the smallish of the bunch I had been looking at. It's super cheap as well - below $200. It's a very clean design and the white and birch color scheme basically match our apartment's color scheme. Took a chance a bought it a few weeks ago. 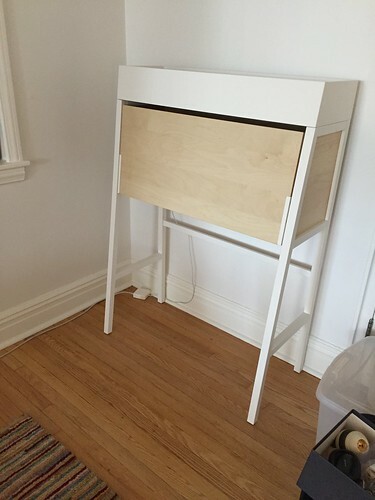 It was a bit of work to assemble in some areas and needed the help of my lovely wife on a few occasions - but if you've built an IKEA product before it's nothing you haven't done before. 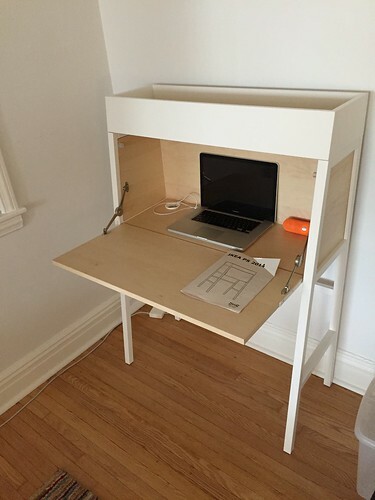 It's sturdy enough except when I'm banging away on my keyboard when it seems like the desk shakes a bit. The flap bit that comes down to form the desktop is fairly sturdy. 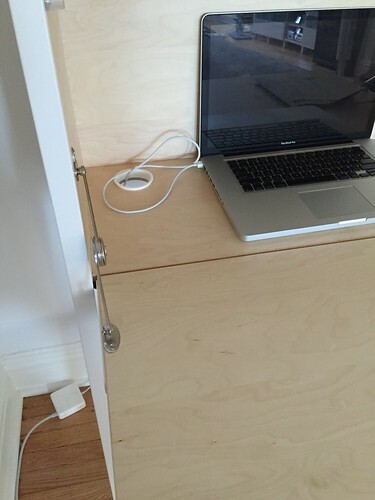 There is a hole for cables but there isn't one for the small (and useful) top shelf - that would be a nice hack. So far so good. I'm sure it won't last me a lifetime, but it's a decent little desk for what I need and it's handsome enough. This was really helpful! I keep coming back to this desk too. I found one on my local Craigslist and think I will go for it. How has yours been holding up? I was thinking of 'hacking' the side panels to provide a bit more interest. Sorry. I forgot to check back here. I was thinking about getting one of these. Do you know the dimensions of the inside? I was wondering if a monitor would fit in there. Thanks!